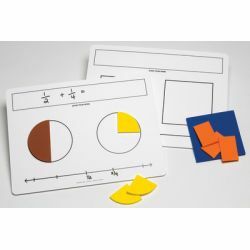 Have students illustrate equivalent fractions or show addition and subtraction of fractions with these heavy vinyl 9" x 12" mats. Use with or without standard fraction pieces (sold separately). Each mat has fraction circles and an open number line on one side and fraction squares and an open number line on the other. Set of 10.